History was made for Africa when the first ever Black Hawk arrived in South Africa, Mbombela last week, making it only the second one in history to enter civilian service outside the United States. Mark Jackson, owner of locally based company, @Leading Edge Aviation at Nelspruit Airfield, took delivery of a Sikorsky UH-60A or “Black Hawk” after it was safely delivered by Van Wettens Breakdowns Services. Mark, who flies for Kishugu Aviation, was beaming with excitement as his new helicopter was safely set down on South African soil from the truck. The process of acquiring this US Army Special Forces aircraft began in August 2016 when Mark bought the Black Hawk and started the long process of importing it to South Africa. Jackson’s son, Pieter, and fellow pilot Tosh Ross underwent specialised flight training in Montana, USA last year to learn to fly this machine. Their instructor will now be visiting Nelspruit Airfield in December to continue their training with Mark this time. Kishugu Aviation will make use of these specialized skilled pilots and aircraft to ensure aerial firefighting is done even more effectively in South Africa. The Black Hawk finally arrived at Durban Port on Sunday, 01 October 2017, where it was carefully loaded by Van Wettens. Then started the long journey through rain and mist, when it finally arrived safely at its new home on Friday, 06 October 2017. The Black Hawk has a very modern design to it, with many few safety features and it is still being built in the USA. This 1980 Black Hawk will now be assembled and painted at Leading Edge Aviation, with the end result in mind of using it in the Working on Fire aerial firefighting fleet. Mark says he will be painting the Black Hawk in the colours of Working on Fire to tie in with the rest of the aerial fleet. “The Black Hawk will complement our firefighting fleet, such as the Huey’s, that we are currently using in firefighting operations. The Black Hawk can reach speeds of up to 300km/h and lift three tons of water per drop, where the Huey’s are currently doing one ton,” says Mark Jackson, one of the most skilled Huey and aerial firefighting pilots in the country. Polokwane International Airport, formerly known as Pietersburg International Airport is located 5km north of the city of Polokwane in the Limpopo province. The airport was once a vibrant air force base with a number of fighter jets based there. The 7th of October saw a welcome return of a Airshow celebrating the National Transport Month initiative. The South African Civil Aviation Authority – SACAA , the Limpopo Provincial Government and @Gateway Airports Authority Limited (GAAL) hosted an airshow and Aviation Awareness Project. Low cloud and rain was what one could expect first on the program of the day, but with a lot of luck the show went on by 11am the show started with the weather improving by the minute with the show opening with Major Geoffrey ‘Spartan’ Cooper in probably the best vapor gripen display to date in South Africa, at one point the entire aircraft was completely covered in a ball of cloud during hard G turns. Gliding is a recreational activity and competitive air sport, in which pilots fly unpowered aircraft known as gliders or sailplanes using naturally occurring currents of rising air in the atmosphere to remain airborne. The word soaring is also used for the sport. The Magalies Gliding Club which is situated 50kim West of Johannesburg, operating out of Orient airfield which has two 1500m grass runway strips. The 23rd September saw the annual return of the Orient Fly-In.The day started with a number arrivals of aircraft from various airfields from around the Gauteng area. The aircraft ranging from ultralights to a Boeing Stearman. It was also a great day to experience the Magalies Gliding club in action as there were a number of glider launches during the course of the day, Orient airfield has some of the best thermal soaring conditions in the world and attracts some of the best gliders pilots from across the world. The Maglies Gliding Club hosted the event and produced a lovely breakfast for pilots and the visiting public all for free.What great hospitality! We would like to thank the Magalies Gliding club for the well planned event,especially Sean De Klerk the clubs chairman, Jason Adriaan as ATC and to all involved. We look forward to attending next years event. If you would like to get involved with gliding please find the details below . Flying Area and Baragwanth airfield. The event saw a number of learners and residents attending the event at the local sports grounds. by a formation of 3 hawk mk120s from 85 combat flying school. At midday the chief of the SAAF Gen Fabian Msimang and Major Geoffrey ‘Spartan’ Cooper arrived in a helicopter formation consisting of a 19 Squadron Agusta A109LUH and a 15 Squadron ‘C’ Flt Bk117. crowd and the imporatance of the South African Airforce, Major Cooper who grew up in Eldorado Park ‘He said he joined the SAAF as it is the most professional place to be and encouraged the youth to choose the right path’. The mini Airshow consisted of the Silver Falcons, a Hawk solo display flown by officer commanding of 85 combat flying school Lt Col Craig ‘Shark’ Leeson. Different helicopters which were used in a mini capability demonstration such as a Oryx ,A109 and a bk117. Bethlehem Air Show to airshow regulars and display pilots is always known as the coldest airshow in South Africa.We arrived at Bethlehem Airport with a Temperature of -1 and cloudy conditions,with aircraft arriving from Rand Airport – FAGM and other airports around Gauteng,there was lots of display aircraft to choose from! Makhalema welcomed all the crowd and Participants who came to enjoy the show from all over South Africa. The show was opened by a Bell 222UT from Henley Air based at Rand Airport and displayed by Andre Coetzee. Next up was the Paradrop from Little Annie An2 flown by Jon-Marc Hill and @Mark Hill. CAPITAL SOUNDS provided excellent sound and commentary during the day and it was also a proud day for them seeing their new Capital Sounds Canopy being put to use with one of the Skydivers Chute. Team Extreme made up of Nigel Hopkins Aerobatics in his Extra 330, Mark Hensman in his MX2, Jason Beamish in the Sbach 342 and Mark Sampson in another Sbach 342 it was the first display seen with all these aircraft in a formation display. Jet action we saw an L39 belonging to Richard Lovett flown by Pierre Gouws and David Laas Impala Mkl flown by Mike Winegards. The Goodyear Eagles – Aerobatics Unlimited Pitts S2Bs flew their high energetic display aswell as Team Torre with there Pitt Special bi-planes. The Puma Energy Flying Lions Aerobatic Team Harvards showing off their new sponsor to the Dihlabeng Local Municipality. South Africas airshow regulars Ivan Van Der Schaar in his Boeing Stearman, Neville Ferria in his Slick 540 and Conrade Botha in his Slick 360 showed off their gentle and high energy aerobatics to the crowds delight. We welcomed back the Silver Falcons Aerobatic Team team to Bethlehem after their absence from Rand Airshow last weekend. Major Mark “Katana” Gentles and his team keeping their formation flying tight and flying the flag for the South African Airforce! This show had to be one of the largest crowds Bethlehem airshow has ever had tothe media perspective.Definitely a country show for airshow lovers to attend. Aviation Central looking forward to next year already! The organisers Khoto Motsoeneng, Stephan Fourie and Malefu Mokoena, Pete van der Spek handling the media and all the sponsors well done on a great show. The Sport Aerobatic Club of South Africa is a section of the The Aero Club of South Africa and is the designated organisation responsible for the control of sport aerobatics in South Africa and will play host to the 29th FAI World Aerobatic Championships during September in Malelane, Mpumalanga. It is the first time that this Unlimited category of championship will be held in South Africa, however the club has hosted international formats in the past. The very first Advanced World Aerobatic Championship was held in Cape Town, Western Cape during February 1995 and has since proven to be the most popular category of the sport. South African pilot Glen Dell was crowned World Champion in the category in 2004. Much like the Advanced category, South Africa was yet again the initial proponent of another category for world championship status, when the country hosted the first World Intermediate Aerobatic Championships in Mossel Bay during November 1994 where Durbanite Michel Leusch took top honours. These championships are held under the auspices of the controlling body for sport aviation, Fédération Aéronautique Internationale (FAI) and the division controlling aerobatics @Commission Internationale Voltige Aerienne (CIVA). This championship will be flown in the Unlimited category of aerobatic sport. Sport aerobatics is an aviation sporting discipline that relies on precision flying that takes place within a kilometre-squared imaginary cube of airspace, usually located overhead an airfield. It is the only aviation sporting discipline that exploits the freedom of all three dimensions of flight. Flight sequences consist of a series of different figures, with each figure being allocated a difficulty co-efficient known as a K-factor. The pilot must execute the figures as they are drawn which are duly graded by a panel judges situated on the ground by way of reference to published criteria such as the precision of lines and angles. The judges start by assuming that the figure will be flown accurately and then deduct marks for any observed errors, allocating a score marked out of ten. There are five programmes to be flown during the course of the championship; a practised Free Known sequence, four Unknown sequences which are to be flown without prior practice and then a final Freestyle airshow-type sequence. The World Champion is the pilot who achieves the highest combined score. Medals are also awarded to the teams based on the results of their top three competitors. Aviation Central team members Flippie Van Emmenis, Trevor Viljoen and Jarryd Sinovich visited the Rand Air Show 2017 the past weekend – Review by Flippie. The The Rand Airshow 2017, or known as “The Grand Rand Airshow” by the older generation was held the 20th August at the Rand Airport – FAGM in Germiston, Gauteng, South Africa. Hundreds of warmly dressed spectator donned the chilly sunny August morning in anticipation of the show and the icy wind kept the coffee vendors in high demand. The show was stared of with Harley Davidson motorcycles and a Ford Mustang parade that was a break from the normal emergencies services, a good change guys! The show was opened with the beautiful Aeronca C-3, the oldest flying aircraft in South Africa! This was then followed by the radial flypast consisting of ten Harvards, a Springbok Classic Air’s DC3 and a Beech 18. The Flying Lions Aerobatic Team was up next with an amazing display as always, one of my, [Flippie’s] favorite of all time display teams! Menno Parsons, owner of Master Power Technologies in his P51 Mustang, “Mustang Sally”, was up next for the first of two displays for the day. The whistling mustang is always a crowd favorite. Sadly the aircraft will be grounded due to a major scheduled maintenance and is estimated to be out of action for about 6 months. Menno was joined by Sir Bacon Van Der Hoof on his display! Photo Jeanne-Michéle White. Slowing the show down with the de Havilland Dragon Rapide from Queenstown, Eastern Cape flown by Flippie Vermeulen and Chipmunk with Jason Beamish. Barrie Eeles and Elton Bondi in a two-ship formation with a difference with a 90° display made possible by Rand Airshow unique display line. Goodyear Eagles – Aerobatics Unlimited with Glen Warden (leader), Nigel Hopkins Aerobatics and Johan von Solms. Then Little Annie took to the skies flown by Mark Hill and son Jon-Mark. She will be celebrating her 30th birthday on the 2-3rd September. Check out Annie Hill for more details. Another dual Chopper display by Menno Parsons and Alister Brown in the Tiger Huey and a Bell 430, a airshow 1st in SA for the Bell 340. Next up was the L39 Albatross flown by Pierre Gouws and Larry Beamish! Nigel Hopkins Aerobatics national unlimited aerobatic champion thrilled the crowd in his Extra 330sc, Nigel will be competing in the world championship to be held in Malelane next month. Go to WAC 2017 for more information of the championships and local and international competitors. Scully, Arnie, Ellis and Sean with The Torre Pitts Special team. The prefect team Nigel Hopkins Aerobatics and Menno. Two RV7’s and MX2 and Extra 300, perfectly flown by Mark Hensman and Pierre Gouws joined by the father and son duo of Larry and Jason Beamish. Team Extreme, Nigel, Mark and Jason! Previously known as the Zoom-Zoom’s, the Extra 300’s are back with Ellis Levin and Arnie Meneghelli, definitely one of our favorites! Larry Beamish in an Embraer EMB 120 closed the 2017 show. The skies above the picturesque town of Malelane in Mpumalanga will be filled with the sounds of aerobatic aircraft when the world’s best pilots pit their skills against each other in the quest to be crowned the best sport aerobatic pilot in the world. 42 competitors from 13 different countries will take to the air in this year’s World Aerobatic Championships, the 29th time since 1960 that it will be held, and the very first time to be hosted in South Africa. The Unlimited category championship is held under the auspices of the Fédération Aéronautique Internationale (FAI) and is undoubtedly the premiere sport aviation event and easily equated to the Formula 1 of aviation sport. 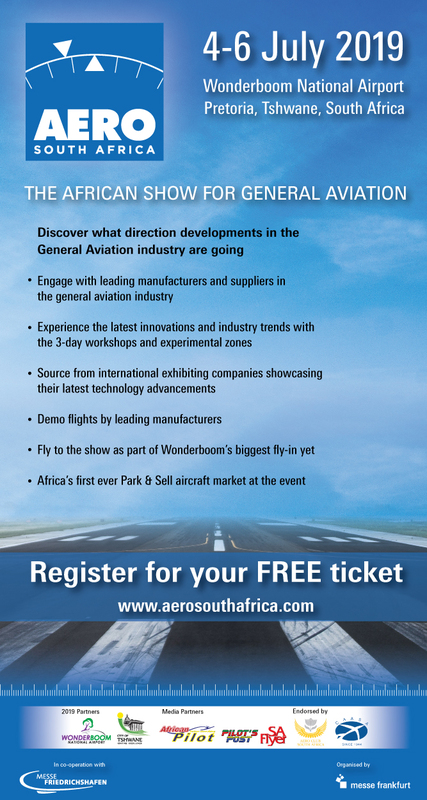 Participants from Australia, Russia, France, United States, Great Britain and Hungary amongst others will ship their high performance aerobatic aircraft to South Africa for the competition and they will be joined by their South African counterparts in doing battle for the honour of being named the best by a panel of International Judges. South Africa has a long-standing association with the sport and local pilots have represented South Africa at most of the previous World Championships, with varied success. Glen Dell was the most successful having won the Advanced category title in 2004, however the team that will wear the green and gold this year do consider themselves to be in with a chance. The South African team consists of Nigel Hopkins Aerobatics, Patrick Davidson, Mark Hensman, Neville Ferreira Airshows, Barrie Eeles and Bertus Du Preez, all well versed with the regimen of international competition. These pilots will take the challenge to the reigning world champion Alexandre Orlowski from France, and will be flying competitive aircraft like Extra 330SC, XA41, Sukhoi 31 and even a locally manufactured Slick 540. Aerobatic competition flights all take place in a cube of airspace above the airfield, measuring 1000m cubed. Malelane is more popularly known as the southern gateway to the Kruger National Park however for the few days in September 2017, aerobatics will take precedence and the residents and visitors alike will be treated to a fine display of precision flying skills by those magnificent men in their Ferraris-of-the-skies.